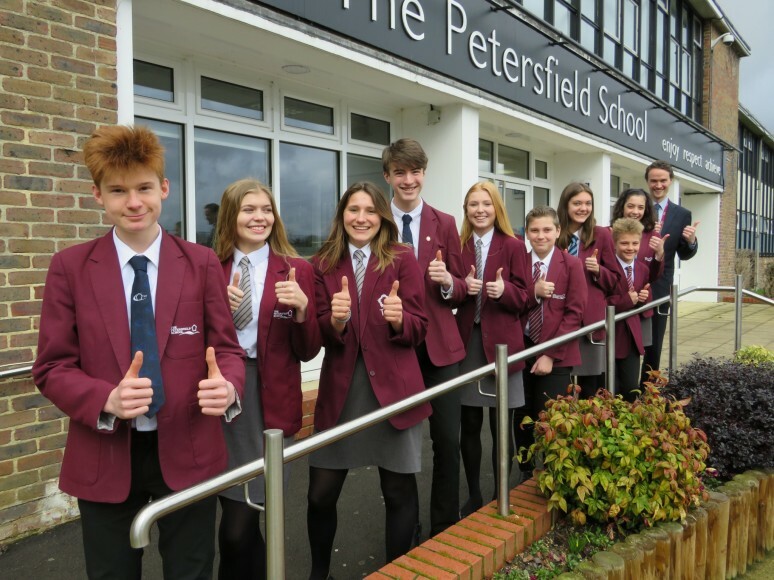 Students and staff at The Petersfield School (TPS) are celebrating this week as Ofsted confirms that the school is on its way to outstanding. TPS was praised for its “strong practice” and deemed “improving towards being outstanding” in a glowing report following a short inspection last month. Inspectors commended Principal Mark Marande on raising expectations since his appointment two years ago, and stated that student progress has sharply accelerated. Ofsted praised the “substantial increases in pupils’ progress in all years”, with the strong 2017 results being “convincingly above average in most curriculum areas”. The Petersfield School is part of the high-performing Bohunt Education Trust (BET) and the report also highlighted how the partnership with BET is “bringing new opportunities for pupils and staff”. TPS achieved the highest outcome possible for a school under the new Ofsted one-day short inspection process. The school’s last Ofsted inspection was in 2014, when the school was judged to be ‘good’. Schools previously judged ‘good’ now only receive a short inspection and this type of inspection cannot result in an immediate change of overall judgement. However, if the inspectors discover sufficient evidence of ‘outstanding’ practice, they can recommend a longer full inspection for a later date where the overall judgement can be changed. TPS received this recommendation from the inspectors. Ofsted noted that an overwhelming majority of parents feel the school is well led and would recommend the school to another parent. Many parents told the inspectors how their children have “thrived in the school’s warm, caring and supportive atmosphere”. Inspectors praised the conduct of the students, highlighting that the atmosphere of the school is “one of calm purpose and enjoyment of learning”, as well as student behaviour in lessons and around the school being exemplary. • The Principal, leadership team and governors are ambitious for their students and carefully consider their best interests in all that they do. • Leaders prioritise increasing the progress of disadvantaged students and rigorously monitor the progress of this group. • Teachers at the school demonstrate “a passion for their subjects” and students’ “attitudes to learning are overwhelmingly positive”. • Inspectors also praised the strength of the curriculum at the school, which “ensures that pupils are very well prepared for the next stage of their education”. “I am delighted that all of the hard work from students, staff, parents and governors is reflected in this inspection report. Our students are rightly very proud of their school and the fantastic opportunities open to them here. At TPS, we foster an unrivalled student experience alongside achieving exceptional outcomes and the report confirms this.